Sydneysiders are spoiled when it comes to leisure options. When they tire of the beach, culture, and nightlife that brims within their city limits, a world-class mountain escape is nearby. The breathtaking Blue Mountains – harboring a series of national parks and conservation areas that have earned a UNESCO World Heritage designation – are set within easy striking distance of Sydney. They're close enough to taste in a scratch-the-surface day trip, but are best enjoyed over a couple of active days. Just back from my own budget-friendly Blue Mountains escape, here are some tips for this sensational Sydney trip. Base your stay in the busy bohemian enclave of Katoomba, buzzing with cafes, shops, galleries, pubs, and outfitters for area excursions. The affordable 15-room 3 Explorers Motel is centrally located, well-managed, and comes with clean, contemporary rooms with dining tables, microwaves, fridges, LCD TVs, and free Wi-Fi; upgrade to a spacious spa suite and get an en suite spa bath for two. Rates start at $139/night. The Blue Mountains boast a montage of natural delights; from plateaus to cliffs, valleys, and waterfalls, all the scenery is crawling with native critters (from kangaroos to colorful parrots), and coated in dense eucalyptus forest. The “bushwalking” (aka hiking) is world-class (and free! ), and adventure activities (rock climbing, mountain biking, etc.) are abundant. Kick off your visit at Echo Point, a helpful point to get your bearings because it's also the mountain's Visitor Information Center. The look-out touts sweeping panoramas of the Three Sisters sandstone rock formations and Jamison Valley and serves as the starting point for the Giant Stairway hike, a steep climb down hundreds of stairs to the valley floor below. The 2.2-mile hike (one-way) leads to the base of the Katoomba Scenic Railway, billed as the steepest passenger railway in the world (it’s currently being renovated and will reopen in fall). When it's open, it’s fun, not to mention a bit of relief for hikers looking for a lift back up to the rim. The railway is run by Scenic World, which also operates valley-level boardwalk trails, the glass-floored Skyway cable car that connects two cliffs above Jamison Valley and Katoomba Falls, and the Cableway cable car that runs between the cliff top and the valley floor. Get unlimited access to all of Scenic World’s attractions for $28/adults or $14/kids. 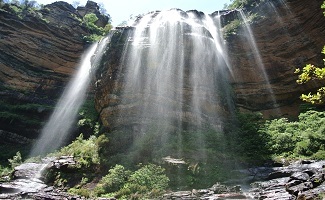 For another one of the area’s top treks, hop aboard the 10-minute train ride ($5 round-trip) from Katoomba to the attractive neighboring town of Wentworth Falls, where you can catch a cab to the trailhead for the 3-mile National Pass, which winds on a cliff face-cut path through a series of waterfalls. It’s undoubtedly one of the most rewarding hikes I’ve ever done. Save on the expense of a car rental with the excellent CityRail train service, offering frequent connections on the two-hour run between Sydney’s Central Station and Katoomba (round-trip tickets cost just $12 off-peak and $5 for children). Once you arrive in town, nab a seat on the double-decker, hop-on, hop-off Blue Mountains Explorer Bus, with service around Katoomba and neighboring Leura (tickets cost $39 for adults, $19 for children, and are valid for up to 7 days). Or, leave the coordination to the folks at Mount ‘N Beach; the Sydney-based operators offer full-day small group Blue Mountains day tours including transit, lunch, and stops at the Blue Mountains National Park, several panoramic lookouts, and the Featherdale Wildlife Park, with options to stay overnight ($239/adult; $167/kids). Click here for more Sydney travel ideas!